When Valerie Sagun first began her yoga practice, she didn't realize how much of an impact it would have on her life. She fell into yoga by "accident" after taking a class at her university. At the time, Sagun was going through a "quarter-life crisis," she said, unsure of what she wanted to do and confused about her art degree. To find some balance, she started practicing yoga to connect with herself, take a break from art, and celebrate body positivity. We’re moving our bodies; we’re having fun. Because of fat shaming — it’s what keeps people from doing yoga and anything in their lives. "Yoga just kind of helped ground me and not feel like the whole world was just cracking upon me," the 30-year-old said. "I felt I needed a break from art a little bit. I needed to clear my mind, and I feel like that's how yoga helped me balance it out." 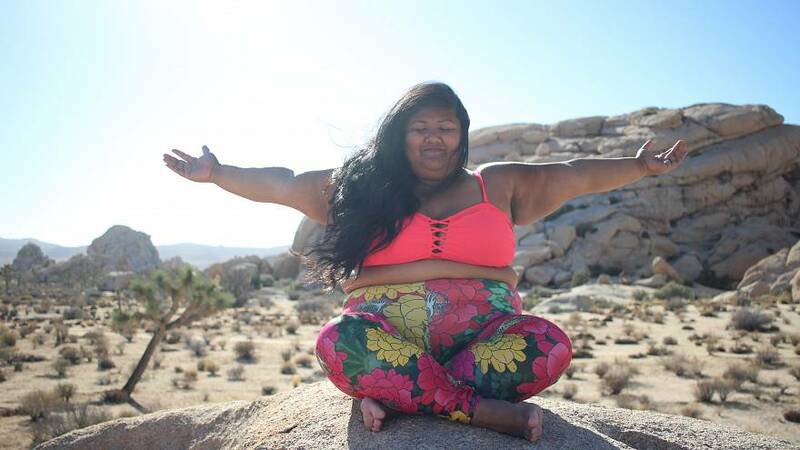 Today, Sagun, whose father is Filipino American and mother is Mexican American, is the force behind "Big Gal Yoga," a platform that advocates for body positivity and representation in yoga. She shares her personal journey on social media while interacting with other yoga practitioners, and released a book earlier this year featuring instructions for those looking to start their own yoga practices. The inspiration for "Big Gal Yoga" came when Sagun first started watching tutorials nearly seven years ago and was frustrated by the lack of representation of plus-size women and women of color. The videos often didn't take into consideration pose modifications geared toward "bigger bodies," Sagun noted, and the women she saw in yoga social media feeds were predominately white and skinny. "Seven years ago up until today, [it] still hasn't really changed much on popular yoga tutorial videos. Yes, there are a lot more now with POC communities making their own videos, or some companies bringing on plus-size and POC teachers, but it still hasn't fully spread to big media," Sagun said, using an acronym for people of color. In January 2013, Sagun started a Tumblr, "Big Gal Yoga," as a personal visual diary and as motivation after a friend asked if she'd be interested in being her maid of honor. She began posting photos of her doing yoga against backdrops of state parks, beaches, and hiking trails and encouraged others to share their yoga journeys as well. "I wanted this to be a visual journey of practicing yoga and being myself, and being a big person, ... and not have to feel so negative about life," she said. Sagun began receiving positive responses and realized there was a need for more body-positive representations of women of color. She began posting video tutorials and challenges on Instagram, which today has more than 153,000 followers. After receiving questions about how to start yoga, Sagun decided to share what she learned in her book, "Big Gal Yoga: Poses and Practices to Celebrate Your Body and Empower Your Life," which was released in July 2017. The book includes yoga routines and pose modifications as well as positive messages, Sagun said. It is geared toward individuals with "bigger bodies" and those looking to start their yoga practice but unsure of where to begin. "Sometimes bigger bodies look different in a pose," Sagun said, noting that the book includes photographs of herself to provide a visual representation of what the modified poses may look like. "In my book I try to find a balance of the other practices of yoga along with a yoga asana challenge, mixed with body positivity and self-love practices because I believe that all of these things work together to make a better yoga practice," she added. While Sagun's content has been well received by fans, she noted that she has also received "fat-shaming" comments and criticism from people who assume she is "glorifying obesity." "That's like, the top comment pretty much on every plus-sized person's page is like 'you're glorifying obesity,' and that's usually the one statement that irks me because it sounds so stupid," Sagun said. "Yes, I'm big, but that doesn't mean I'm promoting — I don't know. What part of my page says, 'go eat burgers?'" It's those sorts of comments that can keep people from trying things, she noted. But Sagun focuses on the positive, practicing self-love through yoga. "We're moving our bodies; we're having fun," she said. "Because of fat shaming — it's what keeps people from doing yoga and anything in their lives. It limits people's ideas of what they can do with their bodies just because it keeps implanting the seed that you are not worthy enough to do anything." Yoga just kind of helped ground me and not feel like the whole world was just cracking upon me. For Sagun, self-love is about finding a healthy relationship with yourself — whether through yoga, or other activities. Sagun hopes to see more plus-size women represented — and in all yoga media, not just in specific niches. There are more plus-size social media influencers today than when she started, Sagun said, but there is still a lot of work to be done, especially when it comes to those in the Asian-American, Latino, and black communities. "I'm the Asian plus-sized girl. There's one of each of us, and that's pretty much what it is, and I want us to all have more representation," she said. "Like, I very much appreciate being the one being highlighted — I've got a lot from that — but there definitely needs to be a lot more. There cannot just be the one person for a whole race."